Here Werner Miller attacks the 4x4 square. 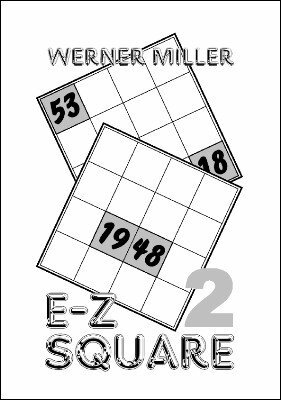 ( E-Z Square 1 deals with the 5x5 square.). You will learn a new and easy method to construct a 4x4 magic square starting with two or four given numbers. Take out a soft measuring tape of the kind tailors use (which has centimeters or inches marked on both sides), and a prediction. Give the prediction to a spectator for safekeeping. You will never touch it again. Have two other spectators place a paper clip anywhere on the measuring tape. Since the tape has markings on both sides the two clips define four numbers. You place these four numbers in the main diagonal of a 4x4 square. With lightning speed and literally no calculation or memorization you fill out the square. The sum of the square will match your prediction. The prediction is a true and honest prediction. No changes, swami gimmicks, or other trickery. Very easy to do. No complicated calculations or memorizations. If you can count 1, 2, 3, 4, ... you can do this. 1st edition 2010; 19 pages.